Thanks so much for your thoughtful and kind review of BRUISED, and for hosting this giveaway! I’m thrilled to have the opportunity to talk about Imogen, the main character of the book. As you pointed out in your review, and rightfully so, Imogen’s not always the easiest character to like. You wrote, “I desperately wanted to protect her even though she doesn’t need anyone’s protection.” Strange as this may sound, I feel the same way about her. While writing the book, I wanted to hug Imogen but I knew she’d hate that and would probably roll her eyes and push me away. She’s definitely a prickly young woman, but more than that, she’s a perfectionist. I think the reason readers are (hopefully) sympathetic toward her is because she’s not a hypocrite – she expects a lot from other people, but she expects the most from herself. Falling short of her ideals the one time it really matters, not to mention the consequences of that failing, are what drive her guilt. For some people, depression is anger turned inward. For Imogen, who’s a black belt in martial arts, and accustomed to coping with life’s ups and downs through physical activity, it’s especially difficult to handle emotions. When her normal outlets are closed to her, she must confront her problems in a different way, and it’s a struggle. Although her circumstances are intense – freezing up at an armed robbery -- I’m hoping that the discoveries she makes in the aftermath about herself, her family, and her friends will resonate with all sorts of people. 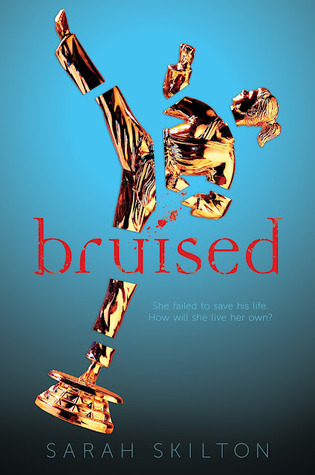 Sarah is a black belt in Tae Kwon Do, a fact that came in handy while writing her martial arts-themed debut YA novel, BRUISED. She and her husband, a magician, live in Santa Clarita, CA with their 9-month-old son. She's never been sawed in half, but there's still time. She loves to read coming-of-age and YA novels, effed up memoirs, and edgy non-fiction. Sarah kindly offered to send a signed hardcover copy of BRUISED to one of you guys. The giveaway is international (she's obviously awesome) and as usual, all you need to do is fill out the Rafflecopter and keep your fingers crossed. But guys, even if you don't win a copy here, make sure to get one some other way. Bruised is a debut you don't want to miss. I did love your review and Imogene sounds like the kind of character I can totally get behind, especially in how she deals with emotions (I'm horrible with them, too!). Well, that was a great character study! I think Imogen is the kind of character that I could easily find myself becoming annoyed with if her development wasn't handled properly. As it is, it sounds like Sarah did a great job with her because I think I would actually appreciate Imogen's personality rather than be annoyed by it. Thanks to her (and you) for hosting a giveaway! I haven't gotten to read this one yet, but I really want to. The reviews on GR have been out of this world and I am a huge fan of contemp books right now, so this sounds right up my alley. As for my favorite 2013 debut I have to say If You Find Me by Emily Murdoch, it's an amazing novel. Thanks for the giveaway! I have been debating on whether or not to get this one but after reading your review and the author's post, I definitely want to read this one now! I love strong female characters and I think I will like (or maybe love to hate) Imogen. I'm so excited to read this Maja! Everyone is just raving about it, and I can't wait to meet Imogen, even if she is a bit prickly at times ;-) I'm fairly certain I can be prickly as well, and I'm certainly a perfectionist, so I have no doubt I'll be able to relate to her. Thanks so much for sharing Sarah's response with us! It seems that Imogen sorta felt betrayed by her own self and she had a hard time learning to trust herself again. Thank you for sharing Sarah's guest post with us! Wonderful guest post Maja, Imogen and her story sound interesting. Thanks for sharing your thoughts Sarah. Let me finish Third, the author is very nice. I really just need to email her and invite her on my blog that way it will get done. I know you enjoyed this one so much and Sarah sounds like a lovely person. It's so wonderful to hear Sarah's take on Imogen's personality and her struggles to overcome her depression. I can't even imagine how I would react in similar circumstances. I especially love this: "she expects a lot from other people, but she expects the most from herself. Falling short of her ideals the one time it really matters, not to mention the consequences of that failing, are what drive her guilt." I felt so strongly for Imogen, even though I know she would never want my sympathy. Such a beautifully written character! I love Sarah's response. Imogen sounds very much like a character I can relate to. Great post and giveaway! This sounds like a great book. Thanks so much for the guest post; it's nice to know more about the main character. I think a friend of mine would really love this...she's a black belt in Tae Kwon Do herself. I honestly didn't give this a second look because of the cover, which is terrible, but true. Your review has definitely changed my mind about that. :) Fantastic guest post as well! Oh my! I just realized that I have not read any 2013 Debuts yet. I think I need to change this situation! I'm excited about Bruised because it sounds so unique. I also saw another author tweeting a couple lines from it and I loved the wording and style. I think I'll enjoy this one! I've been wanting to read Bruised for a while now. Hoping for the best! My favorite 2013 book would be Pivot Point by Kasie West and Life in Outer Space by Melisaa Keil. Thanks for the giveaway! I'm so excited to read this. I wanted to go to her signing in Valencia but I was in Vegas that weekend. My favorite debuts so far this year are... Life in Outer Space by Melissa Keil (high five, Dianne) and Looking for Alibrandi by Melina Marchetta, which I just read for the first time. What a coincidence, as BRUISED is my favorite debut of 2013 so far. It's amazing, and I don't like contemporary books normally. After reading your review and now this guest post, I am convinced that this is one 2013 not to be missed. It doesn't sound like something I'd pick up for myself, which makes me even more interested in reading it! Thanks for the giveaway! It sounds amazing! I'm glad you liked it. And thanks to Sarah for the giveaway! I'm an orange (well, everyone has to start somewhere!) belt in jujutsu, so I'm extremely interested in reading Bruised. It's rare to find fiction in which martial arts are such a main topic (hopefully! ), so a massive thank-you for this giveaway, and am really hoping I'll win (seeing as my wallet cannot afford any more books right now! :-/ )! I completely forgot to add my best read of 2013 so far! D'oh! I'm going to go for Marissa Meyer's Scarlet, the excellent sequel to Cinder!